As a scholar of rhetoric and the Second World War, I have become particularly attuned to how conflict is used and abused by politicians as a means to convince the British public of the value of a particular issue. Most recently, Tory politicians and campaigners like Hargreaves have mobilised Britain’s role in the Second World War as a justification to vote either for or against staying in the European Union (EU). This type of rhetoric is, at its core, emotive and nostalgic. It’s also deeply troubling because such oversimplified ideas of national identity and wartime patriotism are circumventing any chance of having a meaningful discussion about how Brexit would or would not change life on this island nation. It also ignores the fact that the Second World War was a global conflict, however much that might challenge ingrained nationalistic nostalgia. Pro-Brexit references to the Second World War like Heargreaves’s carry within them a number of implicit assumptions, which frame the Second World War as a kind of ‘golden era’. Firstly, Britain is strongest alone. This kind of imagery, of fortress Britain or the valiant island nation, also featured heavily in British wartime publications. But such imagery is also very misleading. As researchers like Ashley Jackson in The British Empire in the Second World War (2006) have made very clear, although this conflict may be embedded within national memory as a British, if not a European struggle, it was in fact very much a global and imperial conflict. After the signing of the Franco-German armistice in late June 1940 and prior to American entry into the conflict in December 1941, Britain relied upon the vast resources and manpower of the Empire and Commonwealth. The British war effort was neither predominantly white nor predominantly island-focused. In 1945, for example, Admiral Louis Mountbatten was counting on the strength of the South East Command, of which 58% were Indian and 25% African. Further support from a variety of continental allies and, eventually, the United States also contributed to ultimate victory. Thus, arguments that Britain would be better off outside of the EU because it was alone and victorious during the last global conflict are a fundamental misrepresentation of the war effort. They consider history only as it is ‘remembered’ in a very specific national context. 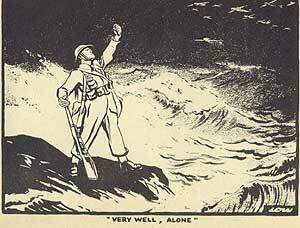 Examining such claims from a broader, imperial or global scope turns the idea of ‘Britain better alone’ on its head. The second problem with using history as a justification for voting ‘leave’ is the glorification of the experience of life in wartime Britain. This nostalgia for a kind of ‘fantastic insecurity’ draws from this very recognisable wartime myth – that faced with catastrophe, the British ‘masses’ pulled together as one to ‘make Britain great again’. However, now is not a time of world war. Nor is war as a lived experience as simplistic as ‘fantastic insecurity’. Granted, Home Intelligence Reports compiled by the Ministry of Information (MOI) throughout the struggle tell us that wartime Britain was not a seething cauldron of defeatism. However, they also reveal a more nuanced image of what life was like during this period, including disdain for its own continental European allies. Rumours, particularly in autumn of 1940, were rife over citings of invading German forces. Reports were filed over snide comments directed towards Jews in London Underground shelters. And in 1941 anti-French sentiment was so high that the MOI suggested a campaign to combat these negative feelings following reports of violent attacks against members of Charles de Gaulle’s Free French naval contingent, who were mistaken for Vichy troops. Voices like Hargreaves are mobilising nostalgia for a kind of wartime cohesion and social homogeneity that did not exist. More importantly, they are arguing that by politically distancing Britain from the European continent, this will eliminate divisive questions such as immigration and restore a ‘lost’ national cohesion. The problem here is that this retrospective tendency makes it all too easy to fall back on the idea that wartime British society—and indeed British society prior to gaining EU membership—was largely harmonious because it did not have to face the issues we are currently debating. Indeed, it faced a different set of problems, which were no less acrimonious as a lived experience in 1940 than those that are currently on the table. In actual fact, there were still huge divisions and massive economic inequalities within British wartime society. Likewise, questions over immigration, and in particular Jewish immigration to Britain’s Palestinian Mandate, remained highly controversial. While these problems were different from those being discussed in the context of Brexit, that doesn’t mean they were any less important or contentious when they were being debated. In other words, a broader look back at Britain and the Second World War shows that voting ‘leave’ will not restore Britain to a golden age of ‘fantastic insecurity’ – because this era simply did not exist. More recently, former Mayor of London Boris Johnson has contended that the EU is essentially comparable to the exploits of Hitler and Napoleon. Britain initially joined the European Economic Community (EEC) under Edward Heath’s Conservative Government in 1973 and subsequently voted, through referendum in June 1975, to stay in the EEC. Early post-war institutions such as the European Coal and Steel Community, predecessors to the EU, were founded with the goal of avoiding another European conflict. Equating the EU with an aggressive and territorially ambitions dictator misrepresents its basic founding. In the context of the Brexit debate, Johnson is employing ahistorical rhetoric in the hopes of manipulating voters to negatively connect the concept and history of the EU with regimes that are essentially incomparable. 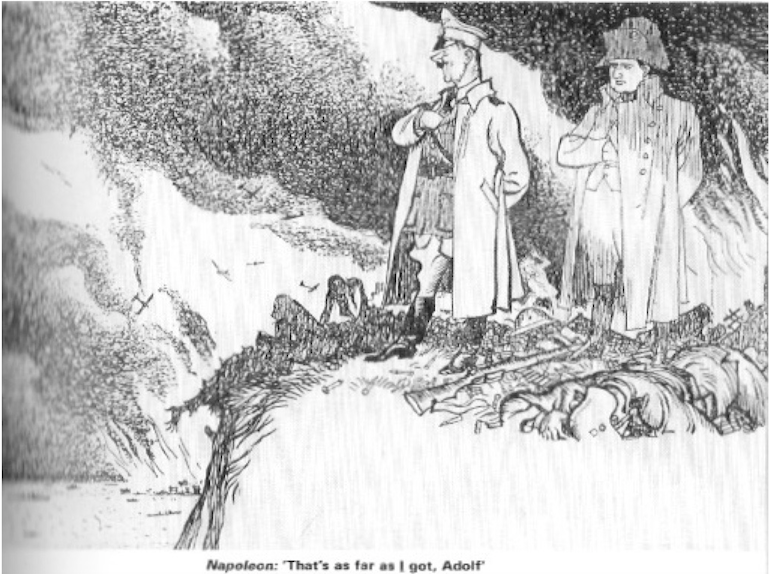 Historical precedent looms large in the form of Napoleon’s ghost, who warns Hitler of the impenetrability of fortress Britain. Daily Mail (30 May 1940). Former Work and Pensions Secretary Iain Duncan Smith, however, has defended Johnson on the grounds that he was citing ‘a historical fact of life.’ Again, the idea that there are indisputable historical facts that should dictate present and future policy is farcical because these so-called historical facts are in actuality ‘historical memory’, and memories can all too easily play tricks with historical reality. As Tony Judt points out in Postwar, wartime memory tends merely to confirm and reinforce itself, whereas the role of history is to create discomfort by challenging and correcting the inaccuracies of historical memory. The ‘Remain’ side of the debate deserves its share of the nostalgic blame, too. David Cameron has launched perhaps the most patriotic memory of all – that of wartime Prime Minister Winston Churchill. On May 9th, one day after this year’s V-E Day celebrations, Cameron argued that Churchill himself would have wanted to remain part of the EU. He cited Churchill’s attempts to keep France in the conflict as long as possible and his sustained lobbying for American entry as examples of the leader’s commitment to “the spirit of cooperation.” In other words, voting to leave the EU would be a basic betrayal of Churchillian and wartime values. Cameron is suggesting that much as this cooperative spirit saved Britain and Europe then, remaining in the EU provides essential regional security now. “Britain has a fundamental national interest in maintaining common purpose in Europe to avoid future conflict between European countries.” Thus, by holding up the EU, and Britain’s place within it as a bulwark against another European war, Cameron is suggesting that to back out of this defence would be unethical, even immoral, and downright dangerous. However, this wartime comparison is also unconvincing. Why? Because the prospect of another European war is simply hard to fathom. Nor is there a looming spectre of Nazism to unite against. Rather, the perceived threats that Britain is facing are viewed as a problem perpetrated and perpetuated by EU membership, namely a basic loss of sovereignty and more specifically the inability to control borders and immigration. Whether arguing for ‘leave’ or ‘remain’, cherry-picking wartime history as a modern means of persuasion only distorts historical events and historical memory. It also reveals the extent to which many of the political arguments of Brexit are based upon emotional appeal to historical nostalgia. In doing so, the histories that have been cited throughout the Brexit debate fail to understand the Second World War, and indeed the past more broadly, within its wider global context. And we are witnessing first-hand the perils of framing Britain’s international policy initiatives through such a narrow and highly nationalised lens. Staff and Agencies in London, “’Like Dunkirk’: Brexit Donor Trumpets ‘Fantastic Insecurity’ of Leaving EU,” The Guardian, 12 May 2016. ‘Home Intelligence Weekly Reports’, 25 June-2 July 1941, INF 1/292, The National Archives. Rowena Mason, “Tories Divided by Boris Johnson’s EU-Hitler Comparison,” The Guardian, 16 May 2016. Alex Morales, “Cameron Evokes War, Churchill Memory in Bid to Avoid Brexit,” Bloomberg, 9 May 2016. Yes, our real allies are the anglophone world and sympathetic former colonies such as India. I am not sure you are correct to dismiss parallels with Second World War when discussing BRexit. Is not the EU a third attempt by Germany to dominate Europe. That was why we were forced to join when we discovered it was succeeding, but we have never been keen members. Our main policy has been to prevent political union and by advocating its enlargement after Maastrict we hoped to make it ungovernable. We even proposed that Turkey should join. But now that has backfired and it is us who are heading for the exit door. By excluding ourselves from the Euro and now with Cameron’s deal to exclude us from political union we are as good as out anyway. It seems to me that the Leave campaigners are just a modern version of the appeasers at the start of WWII who wanted us to sign a peace treaty with Hitler leaving him in charge of Europe. Merkel is no Hitler but her incompetence has made the immigration and refugees crisis a catastrophe. We need a strong British voice in Europe preventing such disaster in future, but that is not being offered in this referendum. If we are debating the importance of historical reality then this is one of several assertions that must be challenged. The British war effort WAS predominantly white. To count the ‘war effort’ in terms of people on active service is a nonsense. The population of UK in 1940 was around 48m and predominantly white. The great majority were involved in the war effort, some risking and losing their lives, many contributing in less obvious ways. Commonwealth nations contributed massively, and India’s role has never been properly acknowledged. Over 2m Indians were on active service and many more helped in other ways. But this was only a small percentage of India’s population and many others continued to campaign against British rule in their country. The author points out that it was a global war. Certainly, but not straight away. When it did widen the British war effort became the Allies’ war effort, including the USSR who lost over 6m people, predominantly white. But if you can isolate the ‘British’ war effort, then it was definitely island-focused. Britain entered the war as a defender of Europe and, only 20 years after the end of WW1, there was a determination to see off Germany good and proper this time. But when Britain came under attack from the Luftwaffe, the picture changed. It was Britain being bombed, Britons being killed in their own country and the war, then not a world war, became predominantly island focused. I agree entirely with the author’s general point but heavens above, we know how politicians work. They could not give a fig about historical reality if it fails to accord with their message. What is needed to deal with political propaganda are the simple questions that journalists used to ask. What? Where? When? How? Why? But few of them rarely ask. There is no question that the “wartime spirit” and the schoolboy references to “Europeans” as a metaphor for historical French, Spanish or German enemies played a part in the Leave’s campaign very clever emotional appeal to the voters. It was clear that they would not win using facts, so emotion was the only lever at their disposal and they used it mercilessly. However, I would argue that this nostalgia goes far deeper than World War 2. The call was for a rose-tinted return to the wealth, success and “British place in the world” painted in TV series like Downton Abbey and Upstairs, Downstairs. One could point to such series as rather a portrayal of the UK as an Empire in terminal decline, but behind the rose-tined upper class drawing roooms, there was the dynamic of the previous century’s Industrial Revolution and the exploitation of the raw materials from and protected markets of, the British Empire. Thus the hidden message of the Leavers, is that somehow this will all be rediscovered, perhaps in the insecurity promised by Mr Hargreaves. Because today, one can with absolute certainty say, that there are very, very few areas of business in which the UK is either dominant or the innovator. Indeed the core business of most of British industry is the sale iof their businesses rather than their products. In 2016: The Financial Times and the Economist, the Baltic Exchange and the LSE, ARM. The list is long…. And if we are turn to the City, it already belongs to Foreigners…. Brexit proises interesting times….we may find that nostalgia returns in the shape of the European Union.